To get the right location for the drain from the bath tub, it was necessary get it out of its shipping box, install the claw legs and place it where it is to be installed. We are installing one of those fancy claw-leg tubs. 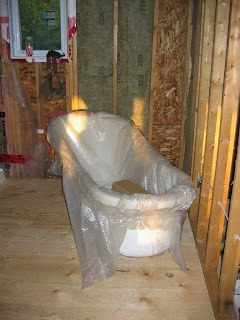 It the picture you can see the tub with the protective plastic still on it. The hole we drilling can be just barely seen in front of the end of the tub.